This festival is a fitting end to the summer — it is absolutely huge and all encompassing. Are you ready to walk, eat, drink and shop? Held the first full weekend in September, the 18th Annual Seafood Festival, which is augmented by Hampton Beach’s Sidewalk Sale Days, is a great way to end the summer and welcome the fall. School has just started and the days are still long and hot. So get ready to chow down, enjoy the beach and water one last time and take in all that the seacoast has to offer. 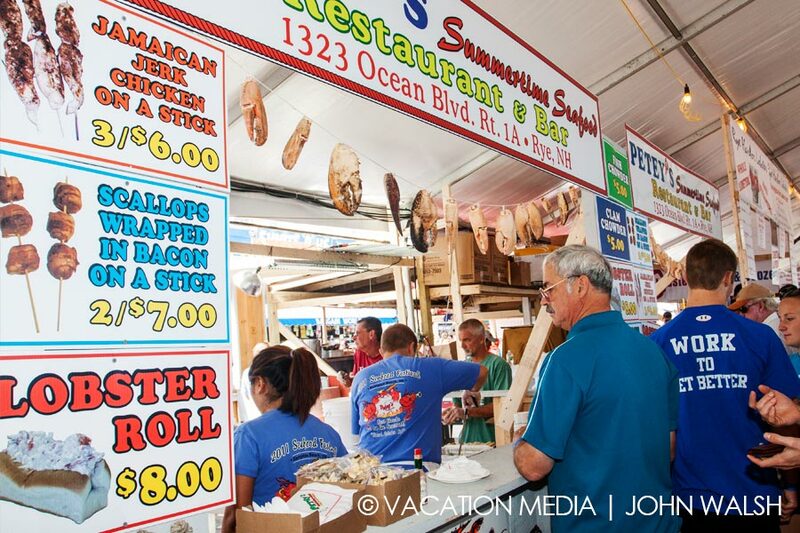 The seafood festival features seafood dishes from over 50 different restaurants and arts and crafts from over 60 dealers and artisans. In the food area, there are plenty of lobster, shrimp, clams and scallops, along with great coleslaws, Bloomin’ Onions, fries and fried ice cream. You want chowder? There are all sorts of chowder. There’s a 200-foot beer tent serving Red Hook and Budweiser. Saturday night you’ll be entertained by a huge and glorious fireworks display-the last one of the summer season. It’s so big that they shut down Ocean Boulevard for the event. There are three stages offering continuous entertainment, an end of the season clearance sale by local shops and continuous games and entertainment for the kids. Don’t miss this humungous event! 50+ 0f the Seacoast’s top restaurants serving our world famous New England seafood. Lobsters, fried clams, shrimp, BBQ ribs, steak tips, “blooming onions”, scrumptious deserts and so much more. 80 Arts & Craft vendors and end of the season sidewalk sales. Continuous entertainment on two stages featuring jazz, oldies, and rock & roll. Pat Whitley Culinary Chef Demonstrations. Kiddie Land with the best in children’s entertainment; face painting, games, and even a train ride. Spectacular fireworks displays on Friday & Saturday with a performance by the United States Air Force Band of Liberty AFTERBURN. Thrilling skydiving demonstration on Sunday. Sand Sculpturing Demonstration by Master Sculptor: Greg Grady.